Benefits from exercising in the winter include helping beat seasonal blues, increasing energy levels and boosting your immune system in cold and flu season, but breathing cold air can have adverse effects on your body. Breathing in cold air when exercising or just going from the house to the car can affect heart health in even the healthiest people. 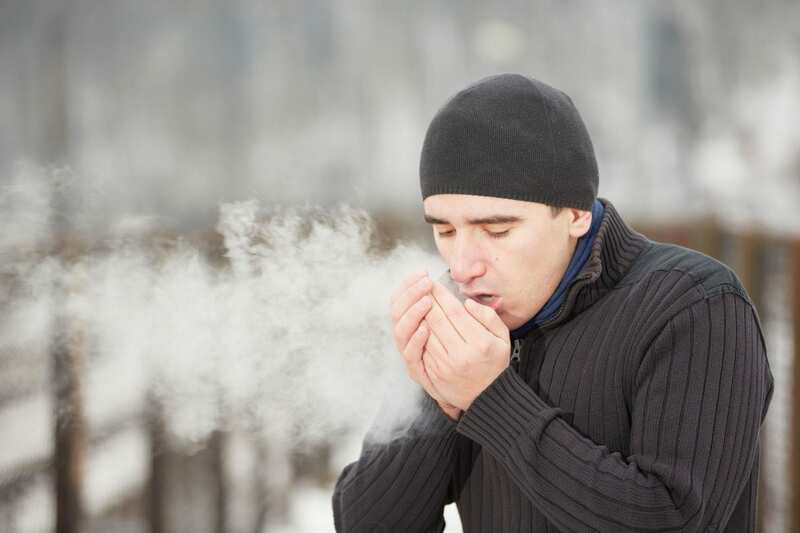 Dr. Thompson says breathing cold air through the mouth stimulates nerve endings at the back of the throat, causing the heart’s coronary arteries to narrow. Body temperature falls, causing blood vessels under the skin to narrow and send warm blood away from the surface to reduce the amount of heat lost through the skin. The risk of angina, which is chest pain caused by narrowing of the heart’s coronary arteries, and blood clotting increases. Easing into outdoor activities, whether clearing the driveway of snow or taking the first few runs down the ski slope, is the best way to avoid shocking the body in the cold, says Dr. Thompson. Keep the body warm by dressing in layers that can be removed when you begin to sweat and added back on as you cool down. Wear two layers on your hands and feet. Wear fabrics that wick the moisture away from your body to avoid chills. Cover your head and ears, where as much as 50 percent of your body head escapes. Avoid eating a large meal or drinking alcohol before going out. Pay attention to your body. If you feel chest tightness or discomfort, nausea or are short of breath, seek medical attention. For more information on the Hartford HealthCare Heart & Vascular Institute and to find a provider near you, click here.